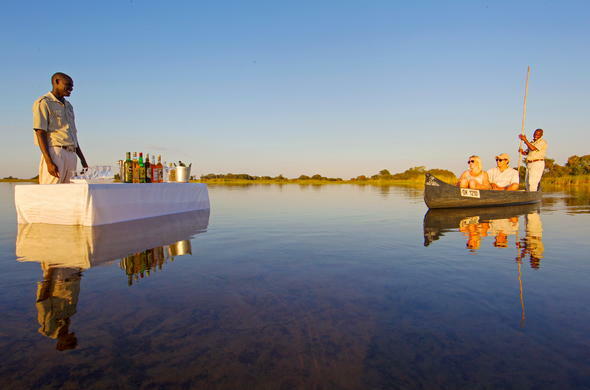 The 3 day Classic Fly-in Original Okavango Package takes you into the Okavango Delta for a truly unique experience, completely surrounded by permanent waters. Includes flights ex/to Johannesburg with no set departures. Your 3 day Original Okavango experience unfolds at what is considered to be the most romantic bush camp in the Okavango Delta. Situated on a remote island, the camp is surrounded by a water wilderness all year round. 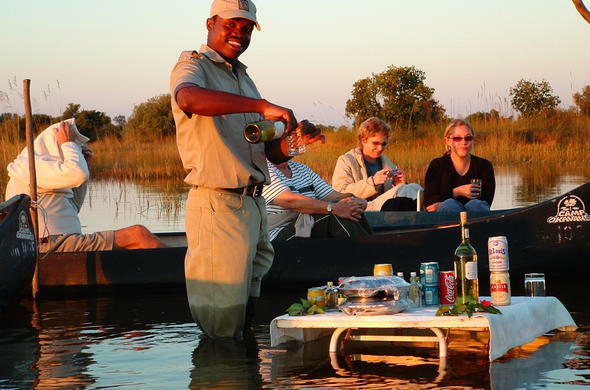 Your Botswana holiday revolves around exceptional game-viewing activities conducted by experienced safari guides. You can discover the wildlife of the Delta on a mokoro ride or motorboat. Guided nature walks on the various islands provide opportunities to track some of the larger species that inhabit this pristine wetland. Bird watchers will be awed by the prolific birdlife that can be seen. Fishing for Bream and Tiger fish is also offered in the Okavango. You can enjoy beautiful views from the comfort of your East African inspired tented accommodation and private deck. In between safari activities you'll be able to savour the peace and tranquillity of the Delta by relaxing at the splash pool or having a siesta in a shaded hammock. You will fly from Johannesburg to Maun. 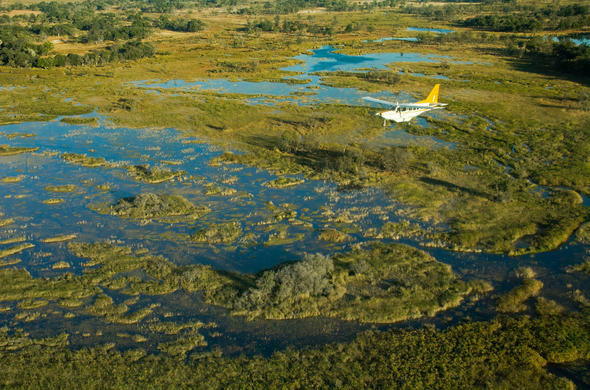 At Maun you will have a connecting light aircraft flight into the Okavango Delta. You will be welcomed and settled in to your bush camp accommodation where you can rest and refresh. 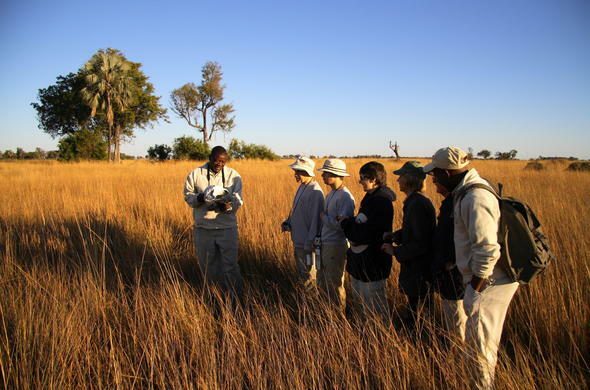 Your Botswana safari will start with a game viewing activity in the afternoon. Later, you can enjoy your first evening round the camp fire and a delicious dinner with the sounds of the African night in the background. After your early morning wakeup call and tea or coffee, you set off on an adventure into the Delta . Your professional safari guide will give you more detail about what you see and experience. The sights and sounds will enthral you. The cooler parts of the day are the best times to see wildlife in the Delta, which has a special diversity of flora and fauna. In this pristine wilderness you will enjoy a feeling of privacy which is quite unique. This is a Big Five safari experience with huge herds of Elephant, Buffalo and Hippo resident in this fertile area. You could also see plentiful antelope, Zebra and Giraffe, and of course the Big Cats and the wily Crocodile are never far away. After your morning excursion, you return to the bush camp for brunch and some leisure time in peace and comfort. High tea is served in the afternoon which is followed by the sunset activity. Daily options include mokoro rides or motor boat outings, game tracking on guided bush walks and fly-fishing. Dinner is usually served in the open under beautiful night skies where you can reminisce about your experiences and the unforgettable memories you have made. Your final day has arrived, make the most of your Okavango safari with a last morning game viewing activity before you fly-out of the Okavango Delta to Maun and then connect back to Johannesburg. This African travel package is based on a 3 day fly- in to the Okavango Delta for 2 guests sharing en-suite accommodation, all inclusive of meals and scheduled activities with flights ex/to Johannesburg O.R. Tambo Airport. This package can be not offered to you from Mid February till Mid March, the camp will be closed. Please ask as for an alternative option. This Okavango package can be also combined with a stay at Chobe National Park and the Savute area.